Like most products issued from the Jimi Hendrix archive in the '90s, several separate releases featuring identical recordings of this one performance have been issued. 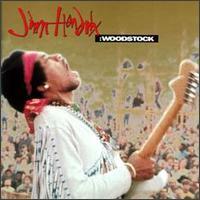 1994's Jimi Hendrix: Woodstock on MCA is the first formal packaging of this most famous of rock shows. Other, more collectable discs followed, often with much more extensive track lists. The Woodstock show that these discs commemorate was supposed to be a headline performance for Hendrix and his band, but after many delays and a fan exodus, the guitarist ended up playing to only a fraction of listeners a full day after the event was scheduled to end. The first performance with new backing outfit Hendrix's Gypsy Sun & Rainbows, this expanded outfit is often difficult to hear over Hendrix and his guitar on this recording. Although very significant, this isn't one of Hendrix's best recorded performances. Relatively pedestrian versions of hits like "Purple Haze" and "Fire" are included. The redefinition of "The Star Spangled Banner" is still considered one of the most chilling rock performances ever, and funky jams like "Hear My Train a Comin'" are also very impressive. Fans might want to consider later releases of this performance that include more material, but one way or another, all devoted scholars of the greatest musician to ever plug in a Stratocaster should own at least one packaging of this performance.